“For everyone to know that we are the soldiers of the Caliphate, and we are coming – God willing,” says Ben Balata. Our Kurdish fixer is translating graffiti sprayed in black on a wall in Batnaya, near to the Iraqi city of Mosul. This town has been decimated by war. The streets are in ruin, there are bombed buildings everywhere, and most homes have been reduced to piles of concrete rubble. Batnaya is a ghost town. 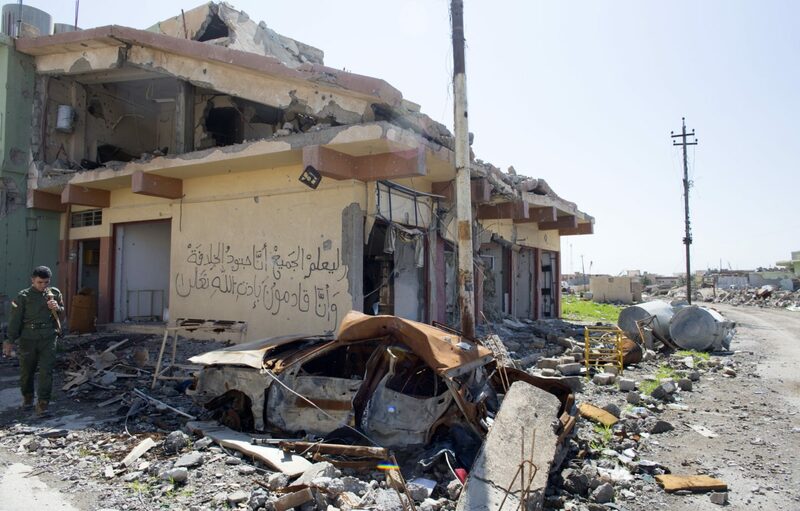 Across from the bullet-marked wall where ISIS daubed its threat, sits the burned-out wreck of a car – rusting metal that was likely used in a suicide attack. A door of a home behind the grotesque vehicle is ajar. 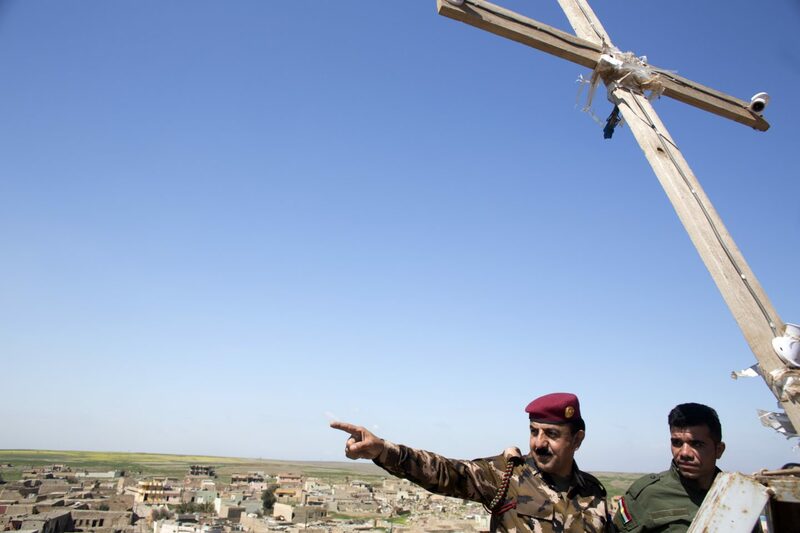 It displays a white cross, signifying Batnaya’s Christian religious denomination, and as we walk through the carnage our armed guides, Kurdish fighters, talk about the battle to take back Batnaya from ISIS. “I was with three others in an American humvee when we attacked the town. We were among the first in. Snipers started firing at us. I saw a car driven towards us…and then it exploded,” says Captain Ayob of the Peshmerga (which means ‘those who face death’). He suffered an eye injury in the suicide attack but remarkably all four soldiers survived the explosion, allowing them to help comrades to chase the Islamist terror group from Batnaya, who’d occupied the town for more than one year. After taking control of Mosul in 2014 – where ISIS is currently battling Iraqi forces – the terror group swept across an area to the north and east of the city called the Nineveh Plains, taking over dozens of rural towns and villages – Christian, Yazidi, Muslim and some of mixed religious denomination. Tens of thousands of people fled terrified. The invasion chimed with ISIS’s massacre of at least 5000 Yazidis in Sinjar, where they also raped and abducted hundreds of Yazidi women. Most Christians fled to Iraqi Kurdistan, the self-autonomous region of Iraq controlled by the Kurds. The Yazidis were targeted because of their faith, as was Batnaya, a peaceful Christian town almost razed to the ground. 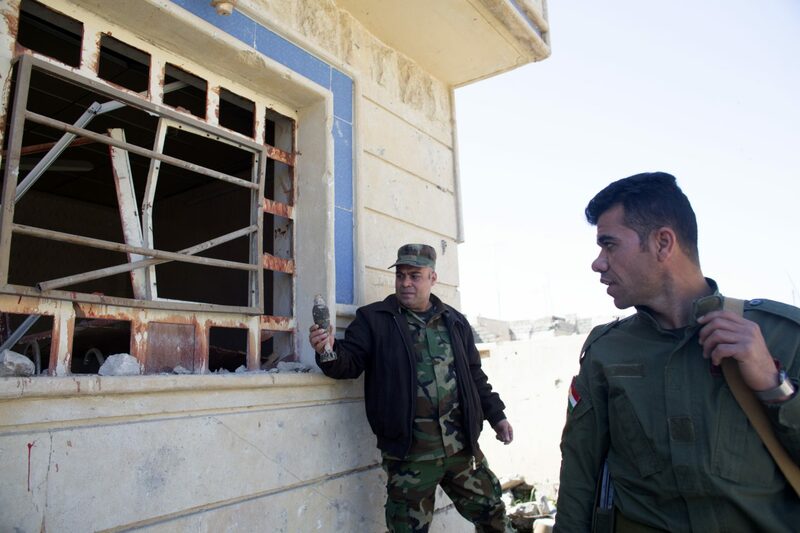 The destruction wreaked by ISIS is jaw dropping. Around 80 per cent of the town has been wrecked and no-one has been able to return their homes. Much of the devastation happened during the day-long Battle of Batnaya – between ISIS and the Peshmerga, backed by the Iraqis – and the terror group enacted a policy of scorched earth before retreating to Mosul, the self-proclaimed capital of its so-called Caliphate. We obtained permission to visit Batnaya from the Peshmerga, who’ve controlled the town since defeating ISIS on the 20th October last year. At the Peshmerga’s makeshift HQ in the town, we meet with the Kurdish Colonel now in charge, Kareem Farho, who says his forces routed ISIS from Batnaya in just one day. “We could have advanced all the way to Mosul but our order was to stay here,” he adds. Colonel Farho – who has 26 years service in the military – says that ISIS took control of Batnaya on the 3rd August 2014. During that period they invaded at least another 10 places in this locality. Before then, around 5000 people lived in Batnaya but the whole population escaped before ISIS arrived. The battle to liberate Batnaya chimed with the offensive to rid Mosul of ISIS last October, in collaboration with Iraqi forces. There were more than 100 ISIS fighters in the town. Around 60 were killed by the Peshmerga, who lost eight “martyrs” during the fight. More than 50 other Peshmerga suffered injuries, many during the battle but some in the weeks afterwards due to booby traps left behind. Colonel Farho said his soldiers liberated another five villages. The clear up operation has been on-going since. The first priority was demine the town and clear it of booby traps and unexploded bombs. This involved bringing in three specialised teams – Canadian, French and American – who, along with the Peshmerga, have now cleared about 90 per cent of the area. ISIS forced its prisoners to build the tunnel network before executing them – so they couldn’t tell anyone Colonel Farho, Peshmurga. Around 80 per cent of homes were destroyed. No reconstruction work has started yet so no residents have returned – and Colonel Farho has no idea how long it’ll be before the community can start rebuilding. It could be years, and the cost will be astronomical at a time when war continues to ruin the economy. 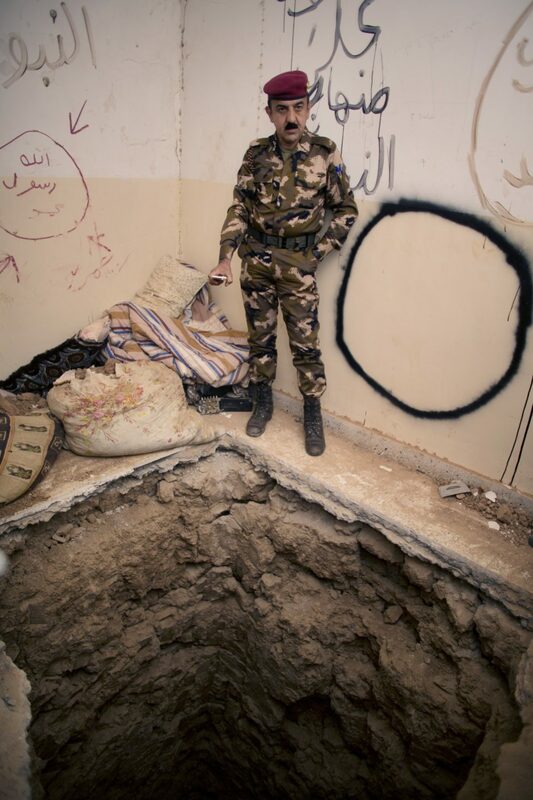 There remains the problem of tunnels which ISIS dug deep under people’s houses. They built a fairly extensive network – up to 10 homes had tunnels underneath – during the occupation. Colonel Farho takes us to one house where the entrance to a tunnel involves a 10 metre climb down a metal ladder – into a system involving a main route and numerous branches, some of which extend hundreds of metres underground. “ISIS forced its prisoners to build the tunnel network before executing them – so they couldn’t tell anyone ,” Colonel Farho says. Afterwards, we’re taken to the town’s main church which is surrounded by destroyed family homes. From afar, the Catholic Church appears undamaged, its red domed roof and spire intact. A tower at the back also remains standing. It was a vantage point used by ISIS snipers before the liberation, and where the Peshmerga later raised the cross of Christ in triumph. The church was made with local stone and although mostly intact, the inside has suffered considerable damage, where the Islamists indulged in a violent rampage of vandalism. There are bullet marks everywhere and the altar has been desecrated, a wine-red carpet leading down from where priests conducted services for hundreds of years, now strewn with broken concrete, wood and smashed marble. A large iron cross removed from the top of the church, stands against a grey marble pillar. Graffiti has been sprayed over the altar and walls. “That says ‘Allah’ and this says ‘Allahu Akbar’ which means God is great,” explains our fixer, Balata, translating writing scrawled on a marble pillar. The Peshmerga say that another church in the town was destroyed completely because ISIS used it as a weapons dump, which was blown up. We walk outside to where the tower stands, passing a marble courtyard, once beautiful but now littered with the debris of war. When they liberated Batnaya, one of the Peshmerga’s first acts was to return the bell to the church and raise a wooden cross on the tower – to replace the sinister black flag of ISIS. At the foot of the structure, we see blankets used by ISIS snipers who manned the vantage point 24 hours a day. There are also spent cartridge shells, a blackened Iraqi coin and the night lens from a high velocity rifle. From the top of the tower, the Peshmerga’s Major Jaffer points to a cemetery about half a mile away, explaining it was desecrated. We descend and make our way there on foot. As we walk through ruins there are visible remnants of ISIS rule. There’s black writing on an entrance to a home that, the Peshmerga say, indicates the HQ of ISIS’s artillery during the battle. Elsewhere, the Islamist terrorist group marked Christian houses with the Arabic equivalent of the letter “N” to denote the derogatory term ‘Nazarene’ – akin to the Nazis targeting Jewish homes back in the 1930s. At one point, the Peshmerga point to a vacuum cleaner at the side of the road which had been boobied trapped. He points to craters in the road and circular areas of ground blackened by fire. He says that ISIS would burn tyres, oil and diesel, to send black smoke into the sky to provide cover from drones and planes. Further along, a family photo album lies in the dust, a couple on their wedding day, pictured smiling at a camera during happier times. When we arrive at the cemetery the Peshmerga advise us to tread carefully – saying we must only step on large stones which they use as a makeshift concrete path into the graveyard. “There could still be booby traps here so be careful,” says Captain Ayob. The cemetery is a mess. There’s been wanton violence with headstones and tombs smashed. Captain Ayob explains that ISIS opened tombs to steal gold from the dead. We leave the cemetery and return to the Peshmerga’s headquarters in the town, where we offer thanks to Colonel Farho and his soldiers for their time. They’ve no idea how long they’ll remain in Batnaya – adding that they’re preparing for what may come next after ISIS is cleared from Mosul. Batnaya is in disputed land, territory once under Iraqi rule but now controlled by the Kurds, so there’s the potential for conflict with Iraq’s Shia militias, among others. Once there’s no more unifying focus on destroying ISIS, there’s the real chance that Iraq could erupt into civil war. What next for Batnaya after the “soldiers of the Caliphate”? Does Scotland have the best A&E waiting times in the UK?